Don't pay extra for a sea view as most rooms have a sea view or over-look the quiet pool. Restaurants/drinks in and around square expensive but there are a few bars and restaurants near the hotel circa half the price. Best, The Bagatelle.150m from hotel is the best. On the flat? check out reviews first.don't go lower than a four star. Good location but self catering is the way to go and there is a supermarket close by. Upper floors of blocks 3, 4, or 5 seem to be the best located for views away from the main block 2 where rather reception, restaurants, bars and entertainment is held. We were on the 4th floor and were very satisfied apart from not being aware of the lack of hob and oven. Boardwalks have been built by the hotels of the area giving easy access to the beach and beach side kiosks and restaurants. The best beach restaurant we found was Os Salgados, a seafood restaurant. One at the other end of the beach was far less agreeable with ambience, food and service. Walking beyond Os Salgados on boardwalks are views of a river/ lagoon where you can see fish, water birds and terrapins. Not too far from Albufeira for more restaurants and shops. Brilliant hotel located very close to the square, where you will find a large number of restaurants and bars. Old town by far the best. Albufeira town is the pits. Must have: tattoo, foul mouth, inability to hold alcohol. Agresive attitude. The exact opposite from above. Food and drinks much better, 50% cheaper. the old town was great,the big square had puppets,mime artist,balloon making etc which was great for kids.off the square there were an array of shops and restaurants we got lost loads of times as there were roads after roads we were there for a week and still did not see every thing.beach great but 15 euros for 2 sunbeds was steep.cant wait to go back next year. The resort entertainment in the evenings centres around 2 areas - The Strip (more for the younger people) - and the Old Town, which is probably better for familes with young children. The are always entertainers in the square in the old town. The beaches are excellent and the whole area is kept fairly clean. Having been to this rsort several times in the passed and loved it i feel that some work is now needed to tidy the place up and smarten certain parts up again.We still enjoyed our holiday but like all holiday resorts continuing to improve always helps. Albufeira is a lovely resort now that the alterations are completed, the addition of escalators down to the old town are exceptionally good, sadly there is a lot of graffiti which mars the appearance of the resort but we will definately go back, the beaches are superb, the mini train is useful for trips between the Strip & the Old town, most enjoyable. 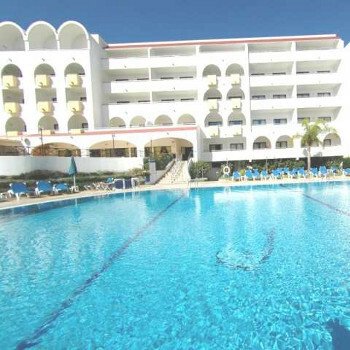 The resort has a great atmosphere about it with a great variety of entertainment both live and disco music. The old town square is a great place to while away the time having a drink or eating, and watching the people go by. The evenings can be spent enjoying the great entertainment and bars the resort provides. It was impossible to walk through the old town or the Strip in peace. Every bar had someone outside pestering you to go in. Quirky hotel - great place to stay.